We Have a Buon Natale | Sprezzatura, Y'all! 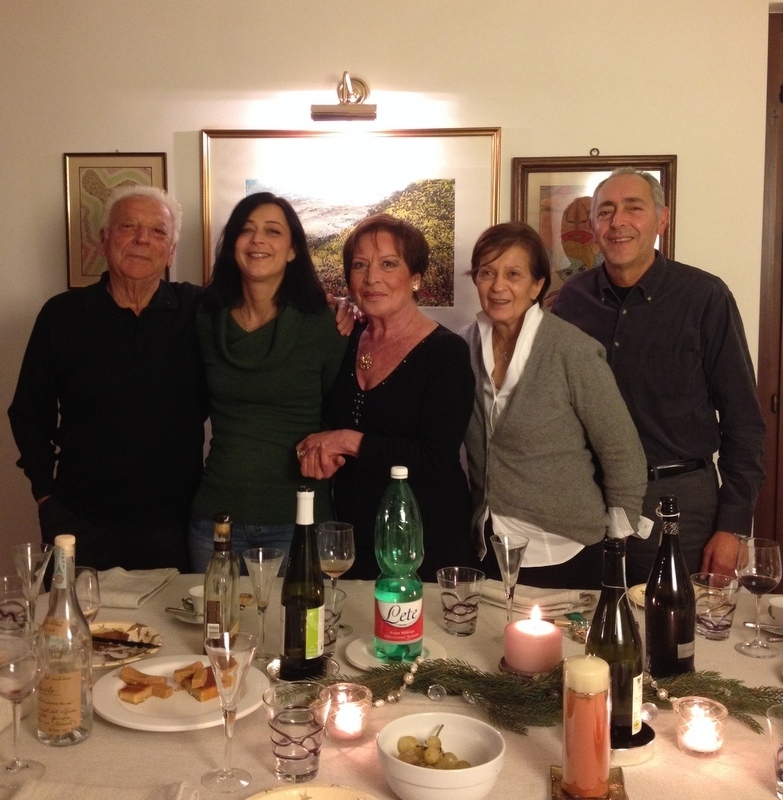 Christmas in Italy is not unlike Christmas in the U.S. People get together with friends and family and have a feast. Here, almost everyone goes to church, whether they’re particularly religious or not. Most people go to midnight mass on Christmas Eve, then come back home and have a snack and open presents. Santa Claus comes overnight to all the good little kids and on Christmas Day, families gather for a day of food and fun. We were graciously invited to our friends Michelangelo and Rosella’s for Christmas. We got there about 11:30 in the morning and left about 10:00 that night. Two of Rosella’s cousins joined us. 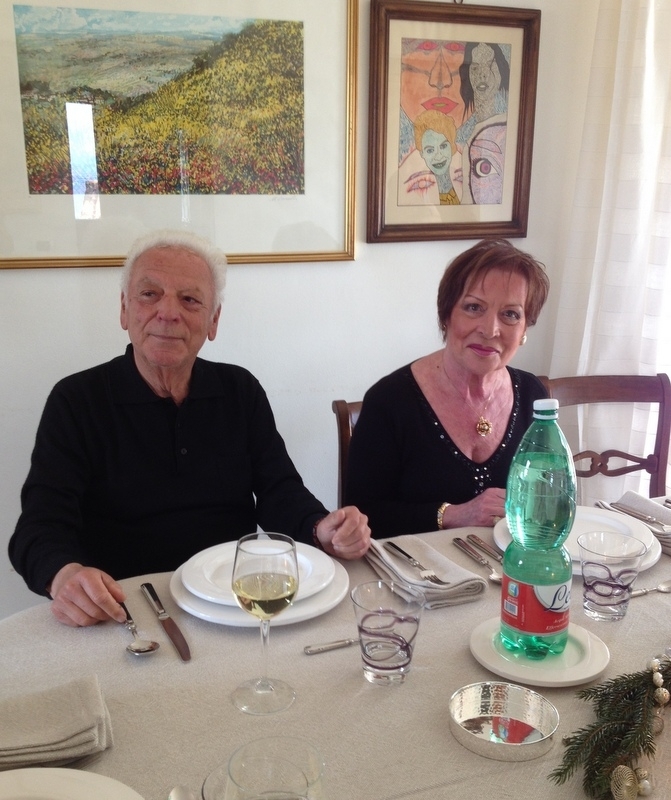 Carlo, a retired architect who lives near Rome, and his sister Paola, who lives nearby in Citta di Castello. Michelangelo and Rosella’s daughter Anna was there for most of the day until her boyfriend came and picked her up. By Italian standards, this was a small gathering. But it was perfect for us. Remember I told you about the cappalletti that we made for Christmas dinner? The little pasta hats stuffed with a delicious meat filling and then cooked in broth? We had those, a leg of lamb, pork cooked in red wine, salad, roasted potatoes, and gobbi. Gobbi is a type of cardoon that’s very popular here. Its preparation is a little complicated (peeling, boiling, soaking), but it’s typically made into a lasagna-type dish layered with cheese and tomato sauce. It was quite good. Everything was quite good, but my favorite thing was the cappalletti in brodo. Maybe it’s because I helped make those little hats, but that was a wonderful, heart-warming bowl of goodness. As I sat there and slurped it down, I even thought for a moment that I might be able to make it at home. I would be on my own without Rosella by my side, but I think I could do it. At an Italian table, you eat a little, get up and move around, take a break, then come back for more. I love this. It makes for a very long meal, but with frequent breaks. It also gave Steve and me and chance to call our grandchildren on what was their Christmas morning and see what they got and wish them all a Merry Christmas. Finally, at the end, came the desserts. Panettone, a traditional Christmas dessert, pecan pie – (straight from the U. S. south – made by yours truly), and many different sweets from Spain. Michelangelo has relatives in Gibraltar and he has just come back from a visit. He brought all these delicious treats back and we sampled every single one of them. We talked and solved many of the world’s problems over the next couple of hours. Carlo and Paola don’t speak any Enghlish, Rosella speaks a little, Steve and I speak pitiful Italian, and Michelangelo speaks everything. He was busy making sure everyone knew what was being discussed. After Paola and Carlo left we were persuaded to have just another little bite of food. Bruschetta (which in Italy is just grilled bread with oil and maybe garlic), mortadella and parmesan. I didn’t think I could do it, but I rose to the occasion and sampled it all. Mortadella is one of hundreds of cured meats that you find in Italy. It’s from Bologna, but bears little resemblance to what we know as baloney. It’s has a buttery meatiness that almost melts in your mouth. And on my hips. And I don’t know why the pamesan cheese here is so much better than what we can get in the U.S. Even what you get in the really expensive Italian food shops (which is very good) doesn’t hold a candle to the salty, crumbly, textured, creaminess of a real parmesan. A little warm toasted bread, rubbed with a garlic clove, drizzled with extra virgin olive oil, served along side the mortadella and parmesan – that’s a late night snack worth having. A little prosecco to wash it all down and we were very happy. A wonderful Christmas in Italy. We couldn’t have imagined a better day, spent with a special family who opened their home to us and made us feel like one of them. So many things we’ve done and experienced here that we’ll never forget, but Christmas is certainly on top of the list. Today is St. Stephen’s day and it’s a special day here. Most people go out for a big lunch together and I can already hear people gathering in the streets. Most of the shops are closed today, but all the restaurants are open. We vowed last night not to eat much today, but how can we not celebrate St. Stephen? After all, that’s Steve’s saint name, so it’s kind of like his birthday, right? Happy New Year Cathy & Steve! We opened The Parisian! All is well, and I wish you much love and happiness for 2016!